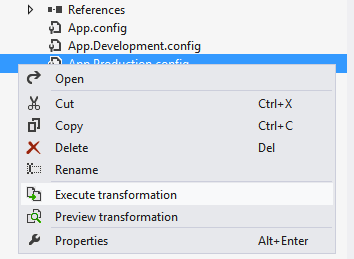 Extension which enables ability to transform various config file even there does not exist build definition for the transformation file. Supports all .NET projects even WebSites. This extension enables ability to transform various config file even there does not exist build definition for the transformation file. For example, if you have multiple configuration transformations, e.g_web.Debug.config_, web.Release.config, web.UAT1.config,web.UAT2.config, web.UAT3.config, web.Production1.config,web.Production2.config. And you want switch between these configuration while developing without changing actual build definition or editing the web.config manually. It supports all .NET projects (web or app configs) even WebSites too. Fix of the badly built vsix package. Support for VS2019. Thanks @tbertenshaw for PR. Support for VS2017. Thanks @tbertenshaw for PR. New option item Write attributes on a separate line added. If this option is set to**true, transformed config has every attribute on separate line. Default value isfalse**. Removement of the .NET 4.5 dependency which caused that it was not possible to install the extension although the framework was correctly installed.